In the rush to get your masterpiece of a main course done, it is easy to forget the side dishes.You can’t have a holiday dinner without side dishes! In my house, I have to have at least two to make the food trifecta: meat, veggie, carb. Somehow, the universe is in order when I have all three! The perfect accompaniment to my smoked rack of pork is Italian Roasted Brussels Sprouts. I use this basic Italian recipe on a variety of oven roasted vegetables and they all turn out great! It makes a quick, easy, and healthy side dish to any lunch or dinner. Enjoy and Winedown! Pre-heat oven to 375 degrees. Line a baking dish with foil and spray with cooking spray. Personally, I prefer Pam with canola oil. It doesn’t burn like other cooking sprays. Wash and trim outside leaves from brussels sprouts. Place sprouts in baking dish and add olive oil, garlic, cheese, salt, and pepper. Toss well to coat. 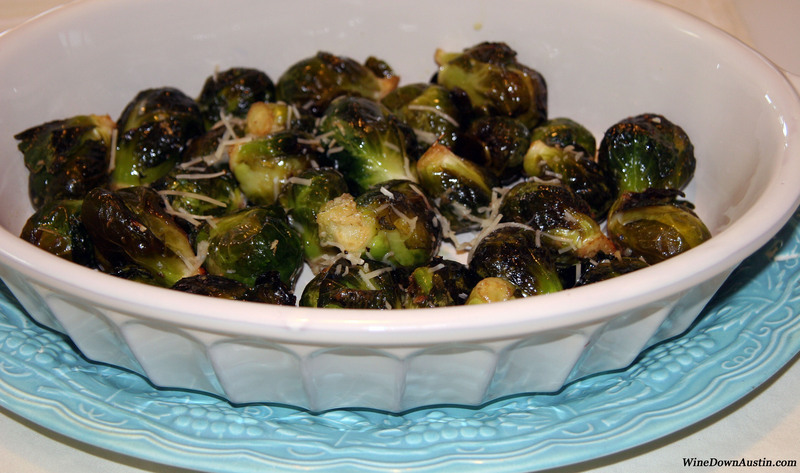 Place brussels sprouts in oven for approximately 35 minutes until roasted brown and tender. Sprinkle extra Parmesan cheese on top if desired. I love roasted veggies from the oven! We’ve been doing brussels sprouts and broccoli lately. And they are so healthy too.